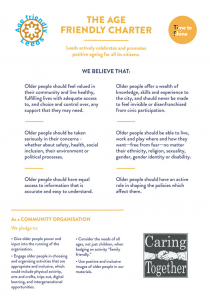 Caring Together is happy to sign up to the principles underpinning the new Age Friendly Charter for Leeds. 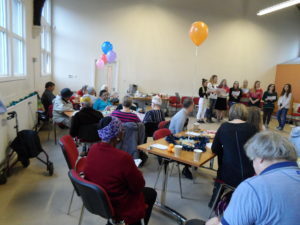 We concur with all its aims of promoting access by older people to quality services, their participation and input into service developments and their right to be consulted about any changes to service provision. 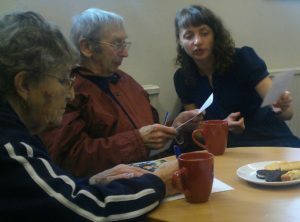 We value the knowledge and experience that older people have and believe that only by their full involvement can services truly represent their full spectrum of needs and exploit their full potential. 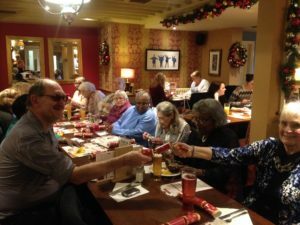 Members of Caring Together were once again recently invited to the annual Notre Dame Christmas party for older people in the locality. 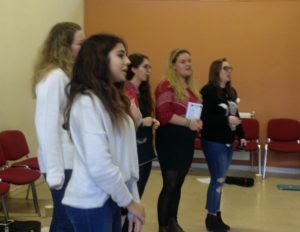 And once again they were treated to fantastic entertainment provided by staff and pupils as well as an array of food and beverages. 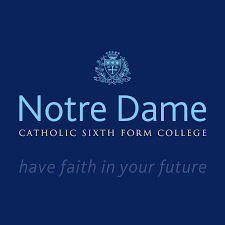 Caring Together values the links that we have with schools in the area and offers thanks to the staff and pupils of Notre Dame for the consistently warm welcome that they make for our members every year. 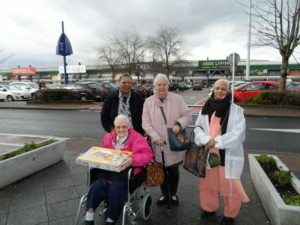 Caring Together, as in other years, organised 2 shopping trips for members this year. 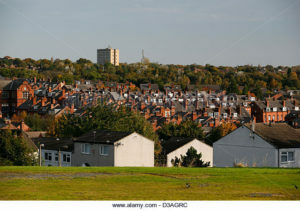 One to Otley and one within Leeds. 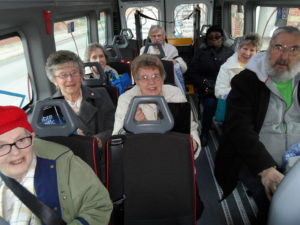 Wades charity provided funding again this year for the costs of minibus hire for both trips. Many thanks to them for their continued support. 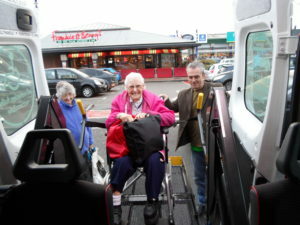 One of the trips was for those who needed a little extra support to get around and we likewise offer our thanks to those Caring Together volunteers who helped out on the day. 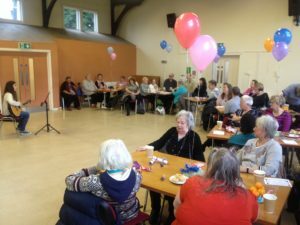 Caring Together held an end of year celebration last Friday at Woodhouse Community Centre for members, volunteers, local older people and supporters and there was a great turnout. We were treated to over an hour of fantastic entertainment provided by LUUMIC. 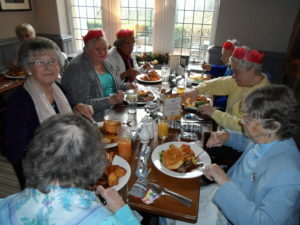 Everyone in attendance had a great time and the quality of music played and the carols sung for us were superb. A fitting end, (well, almost), to the year for Caring Together and an afternoon that many remarked should become an annual event. Many thanks to all those students involved. They are a credit to themselves, their university (and Leeds college of music) and the local community. Some more Christmas cheer arrived at Caring Together this morning, courtesy of the staff at Zurich in Leeds who collected money to enable them to make us 16 festive hampers which they delivered to us today to give out to some of our members. 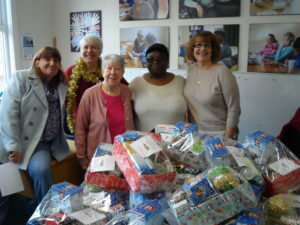 Our office was a hive of activity as the Caring Together Elves , Volunteers, were busy wrapping boxes and packing them with lots of goodies to make up hampers. All the food that went into the hampers was donated to Caring Together by members, volunteers supporters and also from Grove Methodist Church. 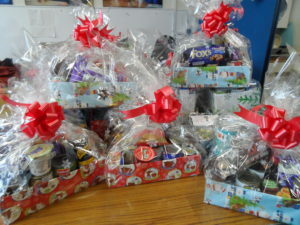 The hampers will be winging their way to our oldest members and some of the most vulnerable. Many thanks to all those who have helped by donating food or by packing and delivering. Some of our members were able to join in on the Little Community Primary School ‘Festival of Light’ event this year, which the school hosted on Friday 25th November 2016. The children made lanterns to carry and walked around the area with their parents/carers and some of our members ending with a Community Supper. 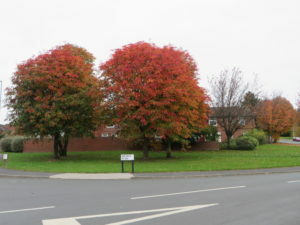 The walk took them on the pathway next to the park, across to the new park, under the bridge and back via the crossing by the Army Barracks, through the new houses and back to school. 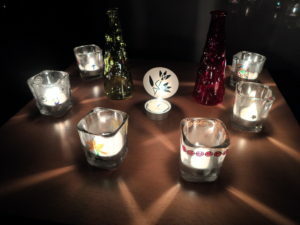 One member noted that the sight and sound of the children walking along, holding lanterns and singing was truly heart warming, he said ‘it went on for a quarter mile and really lifted your spirits with each step’. 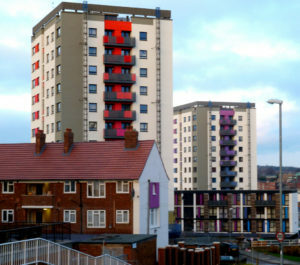 He said, it felt nice to be part of my community; not just with Caring Together members but also the children, parents/carers, everyone is so welcoming. 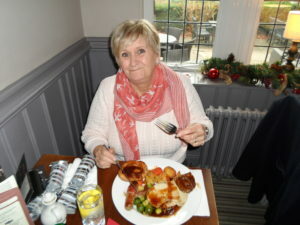 Thank you for the invite from all at Caring Together, we look forward to strengthening our connections further in the New Year. The Caring Together group will be going to a one off event in January 2017 along with some Y5 pupils of Shire Oak Primary School to see their work and pictures in the exhibition. Activities will be organised to help bring both generations together. ‘The exhibition will present images of community. 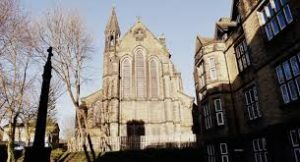 It will include pictures from the Wordsworth Trust archive that capture Grasmere in the 1800s, and these will be contrasted with pictures from the two reading groups in Leeds’. 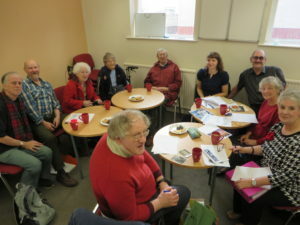 Most of the members of the reading group have contributed a photo to the exhibition that captures their idea of ‘community’ in relation to the poems that have been read and discussed. 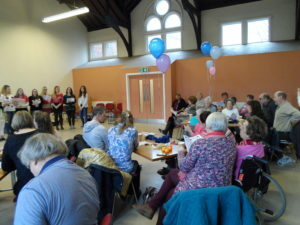 Although bringing different generations together and community working is nothing new to Caring Together, such an opportunity to work in partnership with Anna of the Wordsworth Society on a different subject matter for all was thought provoking, fun and interesting. 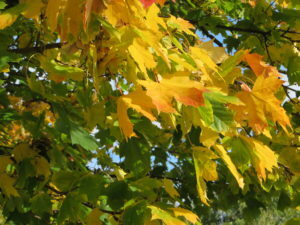 It challenged many preconceptions of poetry among participants. 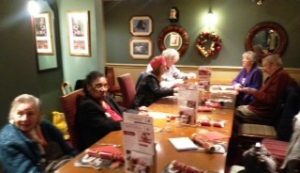 Our members thoroughly enjoyed it and look forward the finale event in January 2017.